On Monday, September 25, Belmont hosted a curb seminar entitled “Artist Development & Music Publishing” in the Johnson Theater featuring Leslie Dipiero, general manager for Tree Vibez Music, manager for Advanced Alternative Media (AAM) and music publisher, creative manager and partner for Tom-Leis Music. Dipiero shared her experience working with country pop band Florida Georgia Line (FGL) through Tree Vibez Music and as a woman in the music industry. Dipiero shared that when she started working with FGL, one of the first changes she made was signing the label’s first female songwriter. She said the band was very supportive and have continued to give permission to her ideas. For FGL, Tree Vibez is a music platform after-hours, a sub-culture of more music and another branch on their tree. Dipiero concluded by advising students to finish college as finding the time later in your career can be challenging. She said that if she had prioritized her education that way, she could have progressed more quickly. She also said that no task should ever be beneath anyone, an important tip to remember in the internship environment. Dipiero encouraged students to be noticed and be excellent at what they do, and that nothing is too small for you to show that excellence. 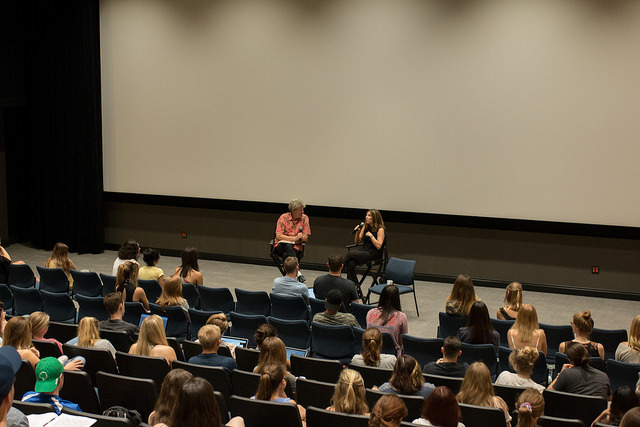 This event was co-sponsored by music business professor Dan Keen and the Belmont University Songwriters Association (BUSA).